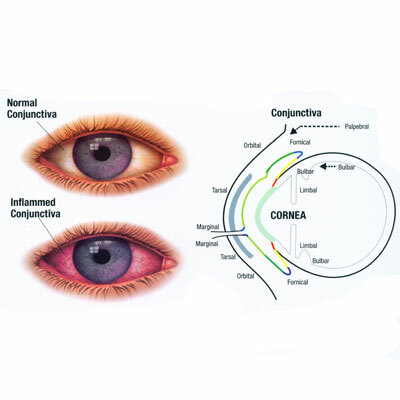 Conjunctivitis is the most common eye disease in the western hemisphere. Because of its exposed position, the conjunctiva comes into contact with more micro organisms than any other membrane. Bacteria, such as pneumococcus, staphylococcus or streptococcus, cause some cases although allergies and some viruses can also cause conjunctivitis. A virus called adenovirus causes other cases. This virus can be spread in many ways including swimming pools, wet towels, etc. The infection usually starts in one eye and is spread to the other quite readily. It usually results in red, irritated eyes and disappears in three days to a week. If the symptoms linger, more acute treatment may be needed. The infection can enter the cornea and create little clouded areas that may affect vision. HealthPoint acupressure uses pressure points all over the body that correspond with your eye symptoms. These include, the inner corner of eye, closest to nose; the outer part of eye, closest to the ear; the web between your thumb and first finger; the web between the big toe and second toe; between the second and third toe; the outer edge of the eyebrow, at the soft part of the temple; and the soft indentation at the base of your skull.